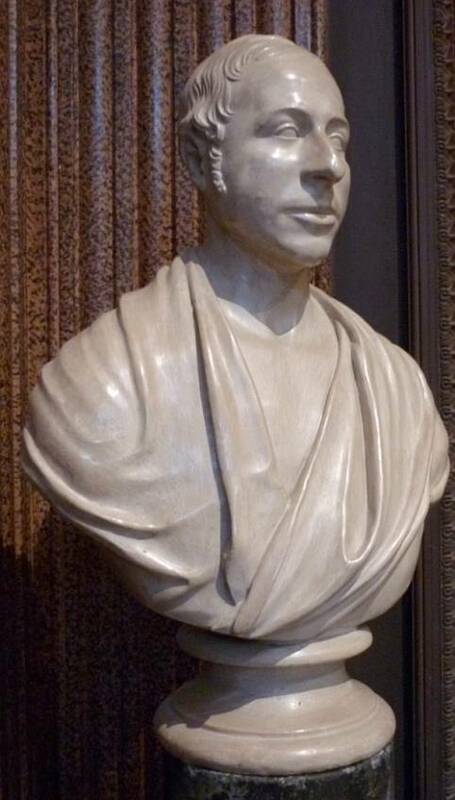 The main interest of the bust is that it shows Basevi, the architect of the Fitzwilliam Museum, said to have been "cold and somewhat haughty" (qtd in John). The only other likeness is a highly stylised one in a memorial brass at Ely Cathedral. As for the sculptor, St John's College, Cambridge, also has a work signed by "Sig. Mazzotti," dated 1834. An Albert Mazzotti, an Italian sculptor, is known to have had a studio in Norwich in 1819, and a Pelligrino Mazzotti died at Wisbech in Cambridgeshire in around 1870. Beyond that, it is hard to find any information about the family. According to the museum's plaque, and its catalogue site, this Mazzotti may have been working from an earlier original, or a cast taken during the architect's lifetime. "Bust of George Basevi" (Fitzwilliam Museum site). Viewed 24 January 2010. "Busts and Masks" (St John's College Library site). Viewed 24 January 2010. The information plaque at the Fitzwilliam Museum. John, Richard. "Basevi, George (1794-1845)." Oxford Dictionary of National Biography. Viewed 24 January 2010. "Strangers' Hall, Norwich" (a local history site). Viewed 24 January 2010.